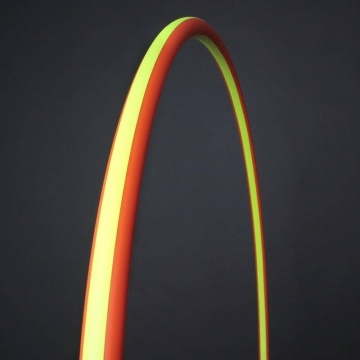 Hula Hoop neon colors: This modern sports equipment is an optical blast! Hula Hooping embodies much more than just beautiful childhood memories: With modern models like the here presented smash Hula Hoop, you acquire an effective training device that brings the whole body into a new shape with sweeping hip movements and vitality. With this neon Hula Hoop, you will also ensure an optical highlight. The vivid and bright colors create an impressive atmosphere when you let it fly around your waist. Thanks to a very light basis weight of max. 380 grams, you will enjoy a high degree of comfort which especially beginners will love. This Hula Hoop does not just look good; it can be adapted perfectly to your needs when ordering thanks to selectable diameter. Please be aware of the fact that an appropriate diameter is one of the most important prerequisites for an effective workout with a high fun factor. Hula Hoop with neon colors: efficient sports equipment can look good! In addition to a unique design with neon colors, nothing has been left to chance in terms of quality and functionality. It is a quality product that is carefully produced by hand in Germany. 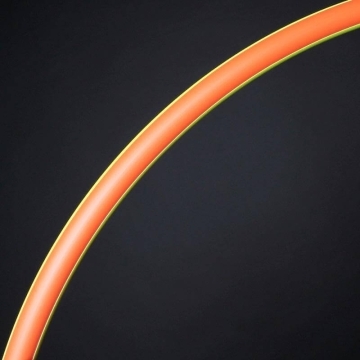 Extremely stable materials such as HDPE give this neon Hula Hoop a great robustness with convincing flexibility. Integrated snap buttons allow with a few easy steps to fold the tire in a space-saving way so that the transport as Travel Hoop is very easy. We offer you the service-oriented opportunity to submit a support request to realize your individual needs in relation to the diameter. We are glad to offer you the possibility to send you a customized sport equipment directly to your home.